The word ‘paradise’ comes from the Persian word meaning ‘walled garden.’ This ideal garden had no sickness or death, and leaving it was a cause of great sorrow. Throughout most of human history, outside the wall was hostile – inhabited by animal and human predators, and extremes of climate and terrain. Some believe all of our history – personal and societal – is a journey seeking a way back to the original garden. 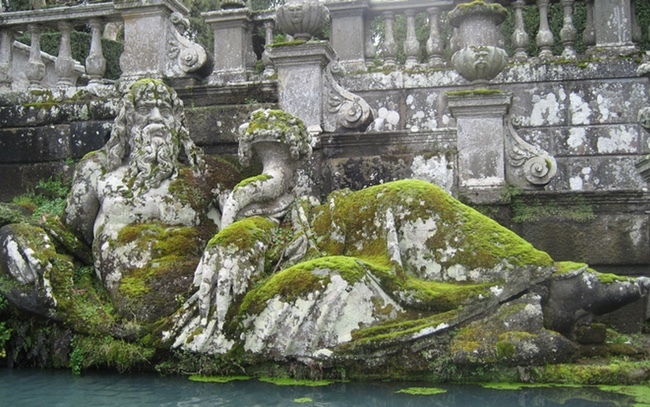 We will journey through time while visiting these Italian gardens and also travel our own personal metaphorical path, which we will integrate through our art meditation and journaling process. Roman and later Italian medieval towns were fortified and protected by walls. Gardens for fruits, vegetables and medicinal plants were enclosed next to castles. Gradually the fortified villas began to open up to nature and the surrounding countryside. Gardens during the Renaissance, while still providing produce, began to be created for pleasure and status, incorporating metaphor and allegory into their designs. Over the centuries many of these gardens fell into ruin and were destroyed. Time has added layers of beauty and meaning to those gardens that remain. Dramatic Pegasus in the garden. We will first visit Civita di Bagnoregio, a medieval hill town only accessible via a long pedestrian ramp. Just as we sometimes react to difficult times by building walls and trying to separate ourselves from others, this hill town was built with steep bluffs on all sides and fortified walls. Over the centuries, the walls have crumbled and fallen away to the valley floor below, just as time can wear down our defenses. We can have new views and open to the world in new ways as we age. Medieval towns had a clear distinction between what was inside the walls ­– safety and civilization – and what was outside – wild nature and the unknown. 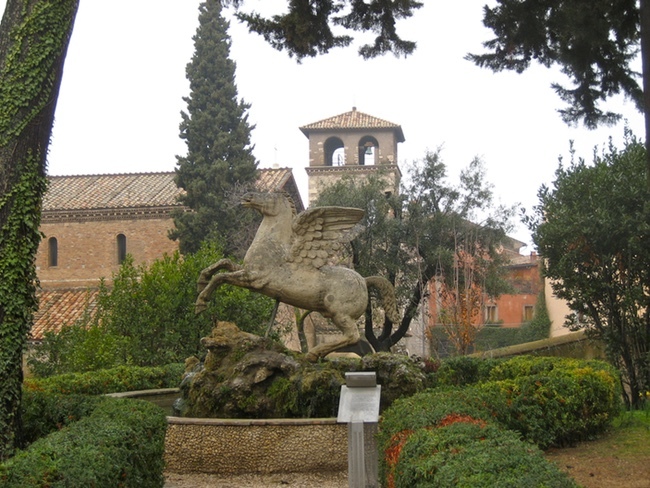 The Sacro Bosco garden of Prince Orsini was personal and idiosyncratic. No other garden like it exists. It is as if the unconscious is released as we wander along twisted paths, encountering mythical creatures carved from living rock, and finally arriving at the Temple of Love. The garden was forgotten and overgrown when Salvadore Dali and his surrealist friends rediscovered it in 1948. It remains mysterious and a powerful metaphor for our unconscious emotions and intuitive journeys. These parts of ourselves can be lost and recovered, with all their twisting turns and hidden surprises – each one of us completely unique. In this garden nature and the unconscious leave no room for rational thought and society. Poseidon reclines in his watery bed. The Villa Farnese is an imposing pentagon shaped palace built on the foundations of a fortress, rising up over the small town of Caprarola. Behind the massive palace, protected by a wall are two geometric gardens – the Winter Garden and the Summer Garden – reached by bridges over a moat. As one wanders farther up the hill, the landscape becomes more naturalistic, leading to a grotto from which water drips. Hidden above the Villa is a summer house, created for the Cardinal to relax away from the formality of the court. The entire ‘hunting’ park is surrounded by a wall and protected by the fortress with only the small bridges as the links between civilized society and wild nature on the hillside. This garden shows the beginning of connection and integration between ‘wild’ nature, now inside the wall and small bridges connecting the gardens to the fortress – society and our conscious mind. Nature itself begins to show a gradation from the formal geometric gardens created as perfect squares next to the fortress and the increasing informality and asymmetry as one moves up the hill away from the fortress. The Villa Lante integrates the connection between wild nature and civilized life on a new level. Starting uphill, water, like our thoughts, flows from a naturalistic grotto down a series of unique fountains and pools, spilling from the unconscious to a more rational and ordered space. The Villa has been split into two pavilions, as if the ego has opened up, to welcome the water down to the large geometric garden with a central pool and fountain. This terrace provides a view out over the valley. Similarly, our flow of thoughts and emotions from our unconscious can cut through stereotypical expectations and with the discipline of order and symmetry, can offer us a new vision of the world around us. The last garden we visit will be at Villa d’Este, a UNESCO World Heritage site in Tivoli, east of Rome. In this garden, the local springs and two rivers were diverted to provide the water for a riot of fountains of every shape and size. The Villa at the top of the garden overlooks the valley and water seems to spring from every level below, leaping down the hillside. This garden, built to impress the visitor with the greatness of the Cardinal through an elaborate allegory of the labors of Hercules, is now a testament to beauty surviving the ravages of time. Most of the fountains have been restored but many Roman statues have been removed. As we age, we can still celebrate the flow of our ideas and energy, and our essential beauty and strength can become more visible as we let go of details from our earlier life. Each day we will have time to reflect and wander in one garden, soaking up the experience and beauty. Returning to our villa, we will have time to rest, walk, read, journal and to process our impressions with guided art meditation. An openness to playful experimentation and a willingness to leave self-judgment behind are more important than an art background. Simple techniques will allow us to focus on creating and integrating our journey through the gardens into our journal. All materials will be supplied. Each woman will return home with a unique record of her retreat experience in her art journal. 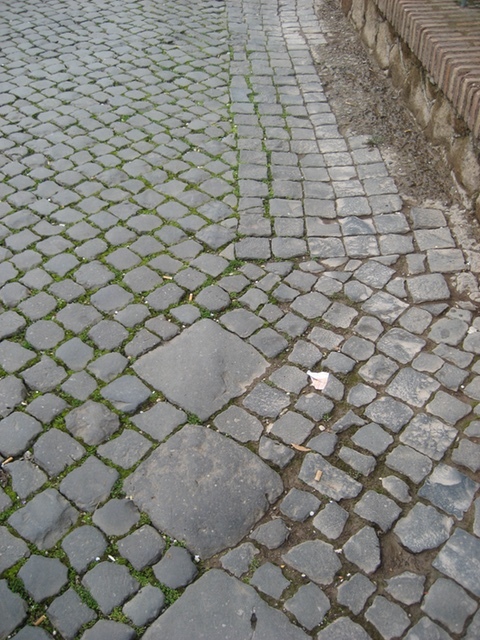 Italian cobble stones have a worn beauty.